Today we are finishing our look at the nominees for the 2013 Florida Artists Hall of Fame. Earlier this week we looked at the 2013 musical nominees and visual arts nominees. Established by the Florida Legislature in 1986, the Florida Artists Hall of Fame recognizes persons, living or deceased, who have made significant contributions to the arts in Florida either as performing or practicing artists in their disciplines. These individuals contribute to Florida’s national or international reputation as a state with a sustained commitment to the development of cultural excellence. The Florida Artists Hall of Fame currently consists of over 30 inductees, including musician and performer Ray Charles, actor and director Burt Reynolds, writers Zora Neale Hurston, Tennessee Williams and Ernest Hemingway, filmmaker Victor Nunez, and visual artists Duane Hanson, Robert Rauschenberg and James Rosenquist. Read more about the program, nominating process, and view the full list of inductees at the Division of Cultural Affairs Florida Artists Hall of Fame page. The author of novels and non-fiction works set in the early 20th Century in North Florida, including The River of The Golden Ibis, The Road to Samarkand, and Florida: A Bicentennial History, was, according to her nominator Robert Holladay,“…a gifted writer, reporter and trained anthropologist with the soul of a poet.” She was often referred to as the Marjorie Stoneman Douglas of North Florida, since her work sought to celebrate and protect the wildlife and natural environment of this region. Her stories of the people of the Big Bend capture a moment in the natural history of the Gulf Coast. Senator Bob Graham heralded her work in a state proclamation. When she died, the Florida Muscogee Creek Nation scattered her ashes in a ceremony normally reserved for Native Americans. Ms. Jahoda’s complete collection of writings, letters and research are contained in a collection at the Strozier Library at Florida State University. Her most well-known book, The Other Florida, pre-dates works that were published later by other writers, calling for environmental conservation and expressing a close connection to the land and waters of Florida. A nationally-known book and magazine illustrator, Alexander Key’s books set in North Florida celebrate the sensibilities of small towns along the Suwannee River and the Gulf Coast, particularly Apalachicola. He sold stories to the Saturday Evening Post and Colliers before beginning to write books. Mr. Key was inspired by local Apalachicola landmarks; weaving tales of local lore into books such as Island Light, The Wrath and the Wind, Suwannee River: Strange Green Land, and other novels. These were well-known by readers interested in stories written in a mythic style with a sense of folk history and inquiry into the natural world. He also wrote young adult science fiction and children’s books after he married and had children, including The Forgotten Door, and his popular Escape to Witch Mountain, which was made into a Walt Disney film in 1975, 1995, and again in 2009. A painter, multi-media expressionist and fabric artist, Adelia Malouf Samaha’s distinctive floral art in a variety of media have become widely known, as have her portraits in oil of prominent cultural figures in the state, including former Governor Charlie Crist. Her choice of media for floral compositions and special commissions has also included pastels, watercolors, pottery, silk screening and stained glass. She is a major supporter of the St. Petersburg Museum of Arts, teaches volunteer art classes in the Pinellas County Schools, and gives art instruction to disadvantaged young students at neighborhood centers throughout the county. Ms. Samaha is celebrated for her support of numerous charities. She donates work to many organizations and local causes. She and her husband have restored two historic buildings, one of which is listed on the St. Petersburg Historic Buildings List. The Reverend O.L. Samuels is a well-known folk artist, largely untrained and unlettered, who began his life as a laborer, became a middle-weight boxer, and then pastor of two churches, before following his dream to become an artist while continuing to preach. His work: unusual wood carvings with a highly colorful ornamental and emotional content, has been much appreciated since he began creating those sculptural pieces in 1983. Rev. Samuels’ art is now widely collected in folk art museums, galleries and in many private international collections. These include the Smithsonian’s African-American Art Museum, the Harriet Tubman Museum, and the White House Collection. His life and work have also been documented in dissertations, films, and published works on the subject of American Folk Art. You can find his website at www.olsamuelsfolkart.com. Florida Folk Heritage 1991 Award Winner Mario Sanchez was a self-taught folk artist who documented his community’s cultural history in street scenes of the Key West and Ybor City Cuban populace which he witnessed for 96 years and characterized in imaginative painted carvings, paintings and drawings. One of his works was chosen by the Department of State as the image to celebrate Florida’s sesquicentennial in 1995. Mr. Sanchez is the subject of books, documentary films, television programs, and many research articles. His work is exhibited in many important collections. In his 75-year career, Mr. Sanchez produced over 600 works. 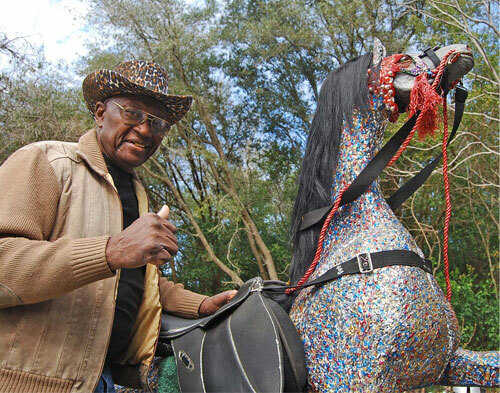 In 2002, the American Museum of Folk Art recognized him as “the greatest living Cuban-American folk artist.” He was a man of the people and the neighborhood. He could always be found outdoors in his garden “studio,” greeting those who passed by as he worked, and sharing memories of early times as he placed these same images into his art. You can view some of his works and read more about him at the Key West Art and Historical Society page. The artist Buell Lee Whitehead grew up in rural Fort Myers when that area was still the backwoods in the 1920s and 1930s. Cutting firewood for the money to go to college, he entered the University of Florida in 1938, and, following war service, graduated with one of the first Bachelor of Fine Arts degrees. His early work attracted so much attention that the University commissioned him to do the official portrait of the dean of the school. As an inspired painter, printmaker, lithographer and engraver, he lived most of his live in Southwest Florida; choosing the subjects of his stylized works from familiar surroundings. 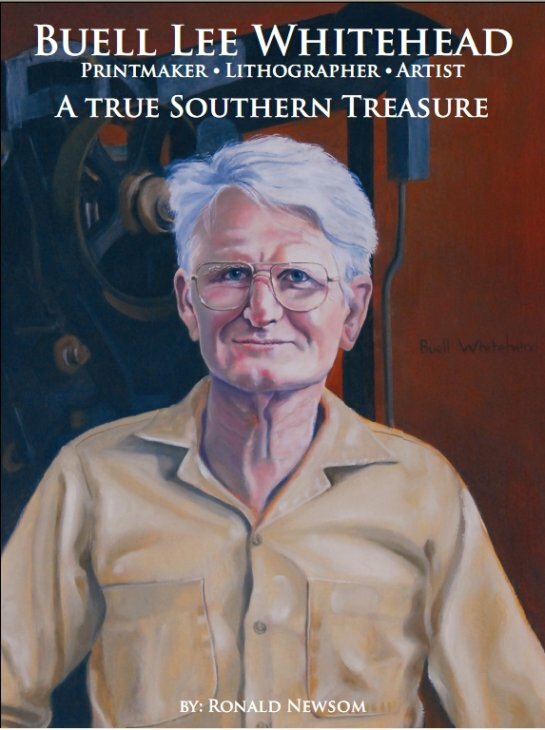 His art chronicles early 20th Century landscapes and community lifestyles from the perspective of the beginning citrus, sugar, timber and fishing industries of that area. Later, he was the first Florida artist who travelled the U.S. selling original lithographs from a press mounted on a flatbed truck that traveled with him. Whitehead was one of the nation’s earliest well-known printmakers. You can read more about Whitehead in Ronald Newsom’s book Buell Lee Whitehead: A True Southern Treasure or at www.buellwhitehead.com. The 2013 inductees to the Florida Artists Hall of Fame will be announced later this year, and they will be inducted on March 20, 2013 during the Florida Heritage Awards in Tallahassee. We encourage you to visit the Florida Artists Hall of Fame wall on the plaza level in the rotunda of the Florida Capitol Building. This entry was posted in Culture Builds Florida, Spotlight On and tagged Adelia Malouf Samaha, Alexander Key, Buell Lee Whitehead, culture builds florida, Florida Artists Hall of Fame, Gloria Jahoda, Mario Sanchez, O.L. Samuels by culturebuildsflorida. Bookmark the permalink.